We decided to travel to London for the first time as a couple. I had once been here on business, but this time was hoping to see more than the changing of the Royal Guard. After landing at London Heathrow airport we arrived to our hotel around 1pm in the afternoon. Still tired from our red-eye flight, we got a few hours rest before setting out for some sightseeing. First priority was getting some food in our bodies, but as vegans, this is always a challenge. We researched vegan restaurants on Yelp.com and found most resided in the Soho Neighborhood. If it was anything like Soho in NYC, we would enjoy it. And it was. 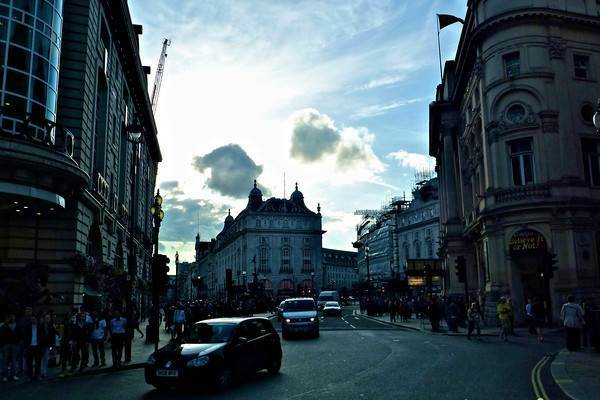 Soho London, is a trendy, active neighborhood with pedestrian only streets on the weekends. We found Vitao Organic and Vegan restaurant just outside Chinatown in Soho London. As we walked in, we were pleasantly surprised to see people serving themselves to a buffet. Awesome, a complete buffet for £8.90! We couldn’t have scored a better deal for a budget meal in Soho. The selection was incredible and we even enjoyed a vegan mango cake as desert. That was extra. After dinner we continued to explore the Soho neighborhood. Chinatown was colorful with street hanging lanterns illuminating the night. That wasn’t the only thing illuminating the streets. Soho is the home of London’s theatre district and film industry. It was a Sunday night, so we were surprised to see the streets packed with tourists and locals alike. In the Soho district we stumbled upon a gay scene, passed the long lines outside nightclubs, witnessed bar patrons catching a smoke outside, and peaked in windows of cafes overflowing with sophistication and trendiness. I am a big Philadelphia Eagles football fan and one of the biggest rivalry games was being played back in the United States. The Philadelphia Eagles were playing the NY Giants, a game not to be missed. After riding the public bus back to Victoria Station, we found the Sports Bar and Grill with some Giants fans already enjoying their lead. Unfortunately, the New York Giants won the game, but at least we found the right bar to watch the day’s football games. While walking through the big train station we grabbed some late night grub from a food vendor to take back to the room. Our hotel sits atop Victoria Station, which provides us a great launching point for traveling in London.